1 Bring broth to a simmer in a medium saucepan over medium-high heat. Reduce the heat so the broth remains steaming, but is not simmering. 2 Heat oil in a Dutch oven over medium-low heat. Add shallots (or onion) and cook, stirring occasionally, until softened, about 2 minutes. Add garlic and cook, stirring, until fragrant, about 30 seconds. Add rice and salt and stir to coat. 3 Stir ½ cup of the hot broth and a generous splash of wine into the rice. Cook, stirring frequently, until the liquid has been absorbed. Continue to cook on medium-low, adding broth in ½-cup increments followed by a splash of wine, and stirring frequently after each addition, until most of the liquid is absorbed. 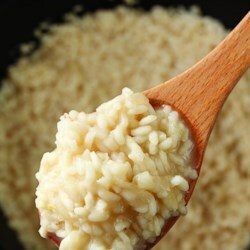 The risotto is done when you've used all the broth and wine and the rice is creamy and just tender, 25 to 35 minutes total. 4 Remove from the heat; stir in ¾ cup cheese and pepper. Serve sprinkled with the remaining ¼ cup cheese. Notes: Bottled clam juice can be very high in sodium. We like Bar Harbor brand, which has 120 mg sodium per 2-ounce serving. Look for it in the canned-fish section or the seafood department of your supermarket. Chicken-flavored broth, a vegetarian broth despite its name, is preferable to vegetable broth in some recipes for its hearty, rich flavor. Sometimes called “No-Chicken Broth,” it can be found with the soups in the natural-foods section of most supermarkets.